This is where I have decided to put the blueberry cake recipes that don't fall under the headings of Coffee Cakes, Cheese Cakes, and Pancakes. Cakes date back to ancient times. The first cakes were very different from what we recognize today. They were bread-like and sweetened with honey. Dried fruits and nuts were important ingredients. The English word "cake" dates back to the 13th century. Medieval European bakers would make fruitcakes and gingerbread. These types of cakes could last for many months. 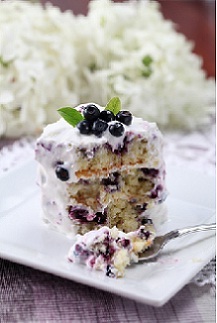 I hope you enjoy browsing through my collection of blueberry cake recipes. Some of these recipes would be just as delicious with raspberries or other fresh berries. Blueberry Dump Cake - Fun for kids! Crock Pot Blueberry Dump Cake ! Blueberry Cone Cakes - great for b-day parties!